We celebrated Christmas a week in advance, just before most of us left the country for our Christmas and New Year vacations. Finding a place central was made easier when one of our part-time classmates gladly welcomed us in her beautiful and cosy condominium in Buona Vista (Thank you, Lyn Kwek! 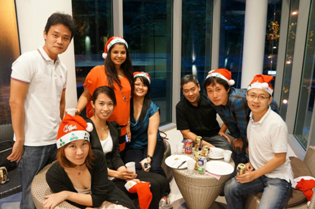 ), which is also near to the NTU-One North Campus where Nanyang MBA’s part-time classes are conducted. We booked a fancy looking function room that sweeps open to the swimming pool area. It was a perfect venue to enjoy the Christmas breeze. 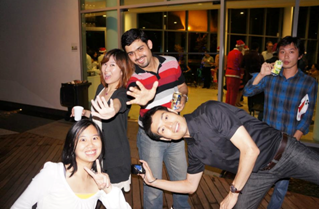 The party was organized by the Student ExCo in collaboration with the Wine, Liqueur and Beer Appreciation Club. Lisa Berk prepared some exquisite homemade German wine while Simon Mathies was in charge of the delicious food (Both Lisa and Simon are co-chairs of the Club). Christmas won’t be the same if there is no iconic figure that we are all familiar with – Santa Claus. Our professor, Norwegian Hanno Roberts, volunteered to give his own Santa robe as a gift to us for the party. 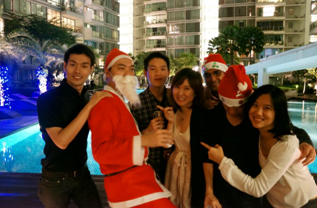 Our mighty friend, Taiwanese Hung yu Chiu or Steve was persuaded to play the Santa that night. He was the most entertaining Santa that I have come across till date. 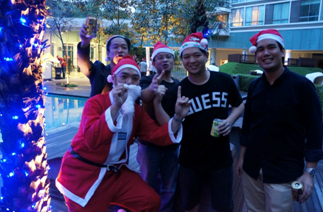 As the night progresses we played the ‘Santa game’ – a common game played during a Christmas gatherings where one brings a unisex gift, based on a name (sometimes it can be a code) that is drawn before the party and an exchange of gifts is done during the party. We played this game to give a twist to gift-giving as each of us came with a ‘surprise’ gift and went home with another. We also played more fun Christmas games during the night, while there were Christmas Carols playing all along. Some of the students even volunteered to form a choir and sang familiar carols, while some of us danced and encouraged everyone to join. By the end of it, the whole batch was on the dance floor. Even until now, whenever I come across pictures taken during that night, I still have the hangover even if Christmas is over.